Earlier this year I picked-up an Illinois Wine map from Prairie State Winery on one of my visits and a new idea started. There are over 100 wineries in Illinois, I decided to make it my personal goal to visit every single one of them. So far I have visited thirteen of them with a couple repeats. The maps are useful when you are planning your trip to a winery so you can figure out how to hit more than one in a day, make it more of an outing. The easy wineries to group together are all of the ones located in or around Galena. My max limit of wineries in a day is four and that is with a lot of breaks for food and water in between so I would recommend making Galena into a three or four day trip. Another easy spot is Shawnee Wine Trail because there are so many concentrated in the area. I like to group the DeKalb county area and Geneva into a day trip too. Start your day strolling Third Street in Geneva then enjoy a tasting at Galena Cellars Winery and Tasting Room. After you finish head west on Route 38 to Maple Park where you will find the Acquaviva Winery, enjoy a tasting and cheese plate on the patio with the grape vines in the distance. Continue your trip to Prairie State Winery in Genoa where you can enjoy a tasting and a glass of wine to finish up your day. 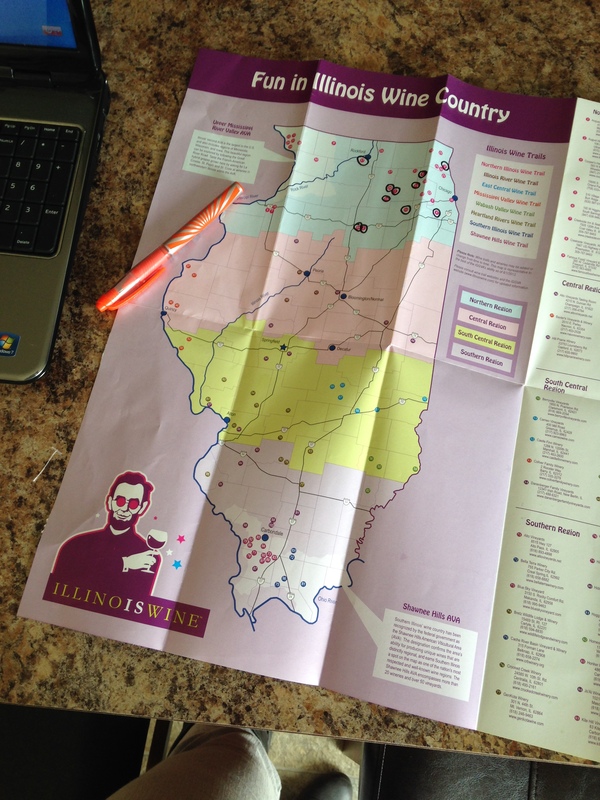 These maps can be found at most Illinois wineries or order a copy through the IllinoisWine.com website. So grab a copy and start crossing the wineries off as you explore them. Make sure to tweet and Instagram your photos using the hashtag #IllinoisWine. How do you figure out what winery you are going to visit next? This entry was posted in Traveling on Thursday, Uncategorized, Wine Down Wednesday, Wine Down Wednesday: Wine, Wine Down Wednesday: Winery and tagged DeKalb, geneva, Genoa, Illinois wine, map, Murphy, Traveling, Traveling Murphy, wine, wineries. Bookmark the permalink. Have you tried any south central Illinois wineries yet? I’ve recently visited a few since moving to southern Illinois, so fun to see all the different wineries and try the wines! We plan to do a southern Illinois wine trail visit in the Spring! I’ve heard they are a hoot. good luck visiting them all, that’s a TON of wine to taste! Just found your blog, now following! I have them on my list and received all the literature but we have not been able to work out a date yet. Where have you tried that I should stop at?